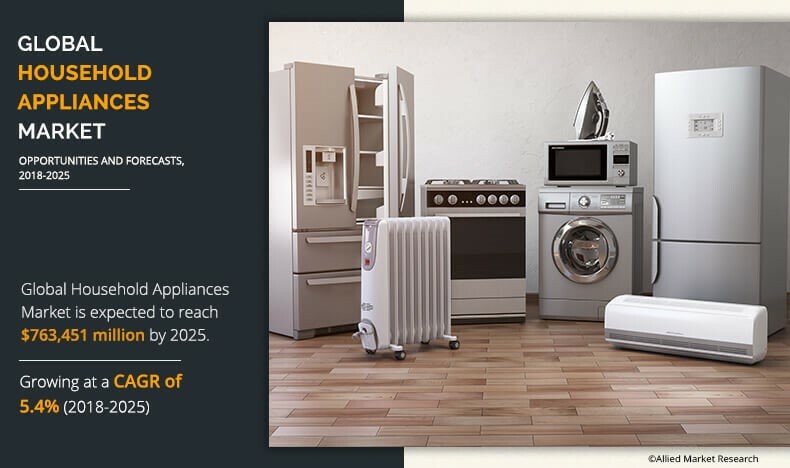 Rapid urbanization, surge in disposable income of consumers, and rising inclination towards energy-efficient appliances propel the growth of the global household appliances market. A comprehensive report, titled, “Household Appliances Market by Product (Refrigerator; Air Conditioner & Heater; Entertainment & Information Appliances; Washing Machine; Cleaning Appliance; Cooktop, Cooking Range, Microwave & Oven; and Others) and Distribution Channel (Supermarket & Hypermarket, Specialty Stores, E-Commerce, and Others): Global Opportunity Analysis and Industry Forecast, 2018 - 2025”, was recently released by Allied Market Research. The report states that the global household appliances market accounted for $501.53 billion in 2017 and is projected to garner $763.45 billion by 2025, growing at a CAGR of 5.4% during the forecast period, 2018-2025. The growth of the global household appliances market is driven by rising affordability of household appliances, increase in urbanization, and surge in disposable income. Market growth is also supplemented by increased access to electricity and decreased time for household activities. However, the rise in price of household appliances and the easy availability of counterfeit brands hamper market growth. Nonetheless, heavy investment in developing economies, rapid technological advancement to develop energy-efficient appliances, and growth in e-commerce sales are expected to create lucrative opportunities for emerging market players in the near future. By product, the others segment, which includes small household appliances like blenders, electric kettle & coffee machines, humidifiers & de-humidifiers, air purifiers, and clothes steamers, generated one-third of the total market revenue in 2017. The segment is expected to maintain its dominance through 2025, owing to their indispensable role in day-to-day activities of consumers belonging to every income group. By distribution channel, the e-commerce segment is projected to register the fastest growth rate of 6.4% during the forecast period. This is attributed to change in shopping behavior due to digitalization, rapid adoption of digital technologies, and a wide range of available discounts and offers on online shopping sites. Asia-Pacific is not only poised to register the fastest CAGR of 6.3% during the forecast period but also retain its dominance through 2025. This is attributed to rise in sales of household appliances in emerging economies such as China, India, and Vietnam, along with an increase in purchasing power of consumers and presence of favorable government policies to promote sales of energy-efficient appliances. The key players analyzed in the report include AB Electrolux, Qingdao Haier Co., Ltd. (Haier), Hitachi, Ltd., LG Electronics Inc. (LG), Midea Group Co., Ltd. (Midea), Panasonic Corporation (Panasonic), Robert Bosch GmbH, Samsung Electronics Co., Ltd., Sharp Corporation (Sharp) and Whirlpool Corporation. They have adopted different strategies including collaborations, joint ventures, partnerships, expansions, mergers & acquisitions, and others to gain a strong position in the industry.